Dumbed down classical music has joined Top Gear on the list of British cultural exports. State broadcaster Radio France, which includes classical station France Musique among its seven national networks, has appointed Mathieu Gallet as its new president, and he has not been slow to import dumbing down from across the Channel. In a press interview M. Gallet has declared: “It’s not acceptable in Paris, for example, that the audience for France Musique is 1.2% compared with 3.5% for [commercial owned] Radio Classique," and promised he would “make a larger place for music and less for musicology". This despite the error of such thinking having been dramatically demonstrated by his broadcasting colleagues in Britain. Giving new audiences classical music without showing them how to listen doesn't make sense. Which explains why listening figures for classical radio - state and commercial stations combined - in the UK has plunged by 10.7% over twelve months. BBC Radio 3 and Classic FM chased audiences but lost listeners. There’s more to listening than meets the ear. 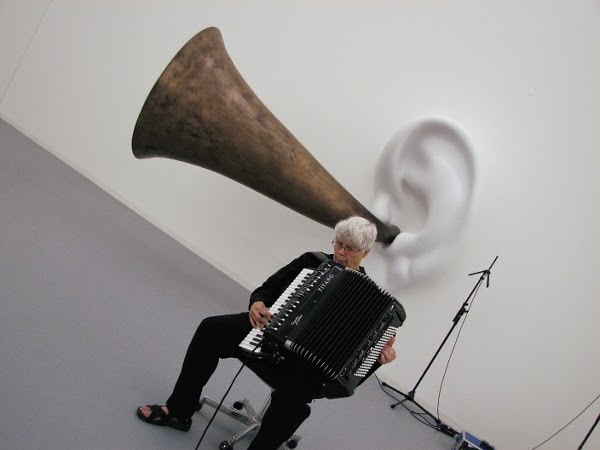 Pauline Oliveros herself describes Deep Listening as “listening in every possible way to everything possible to hear no matter what one is doing.” Basically Deep Listening, as developed by Oliveros, explores the difference between the involuntary nature of hearing and the voluntary, selective nature – exclusive and inclusive -- of listening. The practice includes bodywork, sonic meditations, interactive performance, listening to the sounds of daily life, nature, one’s own thoughts, imagination and dreams, and listening to listening itself. It cultivates a heightened awareness of the sonic environment, both external and internal, and promotes experimentation, improvisation, collaboration, playfulness and other creative skills vital to personal and community growth. Plus it’s a ton of fun. With a piano in most homes, music education used to be about teaching people how to play an instrument. Now with classical music available to everyone via the internet, the focus should have shifted to teaching people how to listen. But it hasn't. In fact it has shifted the other way, to embrace the doctrine preached by Roger Wright at the BBC and Mathieu Gallet at Radio France of increasing availability at the expense of understanding. Which is foolish. Because audience data has shown time and time again that the key to the future of classical music is not changing the way it is presented - it is changing the way people listen. Techniques such as Deep Listening are part of that change. John Cage - who was a major influence on Pauline Oliveros - spoke about 'cleaning the ears of the musically educated', an imperative that, in an age when music education has been replaced by music access, can be reappropriated as 'cleaning the ears of the musically conditioned'. Classical music must learn much from the ear cleaning exercises of Canadian composer, environmentalist, writer, and music educator R. Murray Schafer, and from his pioneering work on acoustic ecology - the relationship, mediated through sound, between living beings and their environment. Mathieu Gallet and and the rest of the dumbing down movement have it completely wrong. Classical radio does not need more music, it needs better listeners. And that will only happen through more understanding. Lutenist Hopkinson Smith had it exactly right when he said that classical music needs 'virtuoso audiences'. Header photo comes via Art F City. Any copyrighted material on these pages is included as "fair use", for the purpose of study, review or critical analysis only, and will be removed at the request of copyright owner(s). Also on Facebook and Twitter.